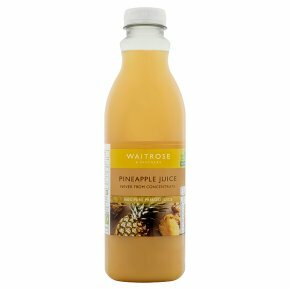 Sweet and balanced, 100% pure pressed pineapple juice, not made from concentrated juice. Not made from concentrated juice - a step by step guide. Fruit is carefully chosen and harvested to deliver just the right balance of flavour, sweetness and acidity. They are squeezed, pressed or crushed depending on the fruit, and the juice pasteurised immediately in the country of origin to preserve it at its best. Finally juices are blended, without adding any water, pasteurised and bottled - the result is a deliciously refreshing juice with a great flavour for you to enjoy. You can count 150ml glass of juice as one of your five a day.